Today we released the .Net SDK beta. It opens the doors for developers to write storage plugins. One of the most common feature requests was adding more and more storage plugin, such as Flickr, CloudFile and etc. Now the SDK enables more developers to do so and do it with ease in .NET language. We wanted the Gladinet Cloud Desktop to be a platform and now the SDK enables it even more. Inside the SDK, you will find a storage plugin example for Windows Azure Storage Service. As you see the full source code for the Azure plugin, you know we are also going down the path of open source too. The Windows Azure Storage plugin will find its way into the open source site (such as SourceForge, CodePlex and etc). The Azure Storage plugin will also be fully supported here in a couple of months as a commercial quality plugin with version 1.3. 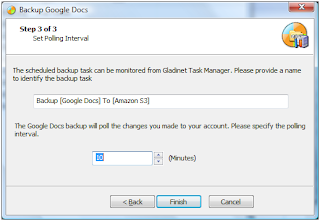 With the recent introduction of Gladinet Cloud Desktop version 1.2, Gladinet has introduced the ability to create an automatic backup of your Google Docs files to a redundant array of cloud storage. This feature allows you to specify a Google Docs source account, a cloud storage target, and a monitoring interval. You can also specify whether you want to use a designated folder or backup all files. If you choose to use a drop box, any files moved to it will automatically get backed up to Amazon S3, EMC Atmos, Box.net, or whichever service you select. Otherwise, all files in the specified Google Docs account will be backed up by the monitoring thread at the specified interval. In either case, the backups are incremental and will just copy the changes.